TS ECET 2019, known as TS Engineering Common Entrance Test-2019 (TS ECET 2019) is conducted on 9th May 2019 by Jawaharlal Nehru Technological University, Hyderabad on behalf of Telangana State Council of Higher Education for admission into 2nd year level Lateral Entry into Engineering/Pharmacy Courses for Diploma holders of Engineering & Technology and B.Sc. Candidates for the academic year 2019-19. Jawaharlal Nehru Technological University, Hyderabad going to release the result of TS ECET 2019 on May 20th, 2019. Candidates can download TS ECET 2019 result along with the rank card in online mode in official website and Manabadi.co.in. With the declaration of the result, candidates who meet the minimum qualification marks criteria will be then shortlisted on the basis of merit list. ECET-2019 is the Telangana Education Common Entrance Test for admission into 2nd year level Lateral Entry into Engineering/Pharmacy Courses for Diploma holders of Engineering & Technology and B.Sc. Candidates in the Universities in Telangana and their affiliated colleges. These tests are being conducted by Jawaharlal Nehru Technological University, Hyderabad on behalf of Telangana State Council of Higher Education. The candidates, who were applied for this entrance test, they were attended the entrance exam 09-05-2019 and they are waiting for their results for join into Engineering courses. The results of TS ECET will be uploaded at web portal by the Department JNTUH. TS ECET exams 2019 Results to be declared on 20th May at http://ecet.tsche.ac.in/TSECET/TSECET_HomePage.aspx Candidates who have appeared for the exam on May 9th, 2019 can check the results from the official website and Manabadi.co.in website. The ECET 2019 exam was conducted to select students admission into 2nd year level Lateral Entry into Engineering/Pharmacy Courses for Diploma holders of Engineering & Technology and B.Sc. in various recognized institutions in the state. Jawaharlal Nehru Technological University, Hyderabad conducted the paper on behalf of the TSCHE. 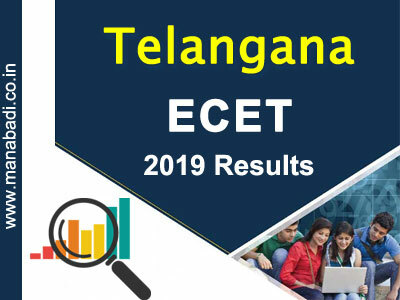 Browse for "TS ECET Results 2019" Link. Your TS ECET results are displayed. The qualifying percentage marks for obtaining a rank in TSECET -2019 is 25% of the aggregate marks in the four subjects (three subjects for B.Sc. Mathematics) i.e., 50 marks out of a total of 200. However, in the case of SC/ST candidates, there shall be no minimum qualifying marks for ranking the candidates. The rank obtained with the benefit of relaxation of the minimum qualifying marks at the TSECET [FDH & B.Sc. (Mathematics)]-2019 by any candidate claiming to belong to SC/ST category will be cancelled in case the claim is found to be invalid at the time of admission. a)	The student will be ranked (Integrated Merit Rank) based on the marks obtained by him/her in the TSECET [FDH & B.Sc. (Mathematics)]-2019 Examination. d)	Resolving Tie in Engineering Stream: In case of a tie in aggregate, the marks obtained in Engineering subject, and in case of further tie the marks obtained in the Mathematics subject and if the tie still continues, the marks obtained in physics subject will be taken into account to decide the relative ranking. In case of candidates getting equal marks in each of the four subjects, they will be bracketed for the purpose of award of rank. Age of the candidate will be considered at the time of admission for resolving the tie, the older candidate being given preference. f)	Resolving Tie in B.Sc. (Mathematics) Stream : Candidates will be ranked based on the marks obtained in the entrance examination. In case of a tie in aggregate, the marks obtained in Mathematics subject and in case of further tie the aggregate marks obtained in the qualifying examination shall be taken into account to resolve the tie. For admission into Degree programme in Information Technology and Computer Science and Engineering, first preference will be given to candidates who have obtained the Diploma in Information Technology and Computer Science and Engineering respectively. Any seats still vacant shall be filled with candidates who have obtained their Diploma in any branch of Engineering / Technology on the basis of their integrated merit ranking. For admission into Degree programme in Textile Technology, candidates who have obtained their Diploma in Textile Technology (Design & Manufacturing) and Textile Technology (Knitting) must necessarily have completed their Intermediate or equivalent with Mathematics, Physics and Chemistry as compulsory subjects. For admission into Degree programme in Bio-Technology, first preference will be given to candidates who have obtained the Diploma in Bio-Technology. Any seats still vacant shall be filled with candidates who have obtained their Diploma in Pharmacy or Chemical Engineering in the ratio of 1:1 respectively. Diploma Holders of Special Diploma course in Industrial Electronics & Instrumentation Engineering / Diploma Holders in Electronics & Instrumentation Engineering have to appear for ECET - FDH Examination in Electronics & Instrumentation Engineering only (EIE) for admission into Instrumentation Engineering (IE) / Electronics & Instrumentation Engineering (EIE) / Applied Electronics & Instrumentation Engineering / Instrumentation Control Engineering courses. The qualified candidates from B.Sc. degree holders will be considered for admission only after exhausting all branches of Diploma holders. Candidates should have appeared and qualified at the TSECET-2019. May appearance at the Entrance Test does not automatically entitle a candidate to be considered for entry into any course unless the candidate satisfies the requirement of eligibility and other criteria laid down in the rules of admission. Admission to 85% of the seats in each course shall be reserved for the local candidates and the remaining 15%of the seats shall be un-reserved seats as specified in the Andhra Pradesh Educational Institutions (Regulations and Admissions) Order, 1974 as subsequently amended. The lateral entry seats in case of Un-Aided Private Professional institutions (Minority & non-Minority) are 20% over and above the sanctioned intake into the course. In case of University Colleges the lateral entry seats are 10% over and above the sanctioned intake into the course. While filling up the lateral entry seats based on the TSECET-2019 ranks, B.Sc. (Mathematics) stream students will be considered for admission only after exhausting all the qualified diploma holders. Candidates who are looking for the Telangana ECET Web Counselling need to carry the mentioned documents in the official notification. Attend the TS Engg Entrance Test Counselling at mentioned date & time. Pay the TS ECET Web Counselling Application fee and take fee receipt. By using these credentials, you have to enter into the Telangana Engg Entrance Test Web Counselling. Keep TS ECET fee receipt for future purposes. You will receive college allotment order by SMS at your registered phone number.